What is markup definition and what is the difference between margin vs markup? Markup calculator ("mark up calculator" is an alternative spelling) is a business tool most often used to calculate your sale price. Just enter the cost and markup. It can also be used to calculate the cost - in this case, provide your revenue and markup. If you would like to use as a markup percentage calculator, then provide cost and revenue. Keep on reading to find out what is markup, how to calculate markup and what is the difference between margin vs markup. You may also want to try markup/margin with VAT or markup/margin with sales tax, plain VAT calculator or sales tax calculator. Markdown calculator does a nifty thing - it shows you what markup or margin you need to set to be able to give a certain discount to your customer and still maintain a desired level of profitability. Margin with discount is especially helpful when you want to negotiate a price with the customer. Free your mind of math and focus on the talking! The basic rule of a successful business model is selling a product or service for more than it costs to produce or provide it. The difference between the cost of a product or service and its selling price is called markup (or markon). As a general guideline, markup must be set in a way to be able to produce a reasonable profit. Markup price can be given in dollars or as a percentage of either cost or selling price. In our calculator, markup formula relates to the profit to cost percentage ratio. Profit is a difference between the revenue and the cost. For example, when you buy something for $80 and sell it for $100, your profit is $20. The ratio of profit ($20) to cost ($80) is 25%. Now that you know what the markup definition is, keep in mind that it is easy to confuse markup with profit margin. Profit margin is a ratio of profit to revenue as opposed to markup's ratio of profit to cost. With the profit margin, you compare your profit to the selling price, not the purchase price. In our example, we would compare $20 to $100, so the profit margin equals 20%. Determine your COGS (cost of goods sold). For example $40. Find out your gross profit by subtracting the cost from revenue. We're selling for $50, so the profit is $10. Divide profit by COGS. $10 / $40 = 0.25. Express it as a percentage: 0.25 * 100 = 25%. This is how to find markup... or simply use our markup calculator! The markup formula is as follows: markup = 100 * profit / cost. We multiply by 100 because we express it as a percentage, not as a fraction (25% is the same as 0.25 or 1/4 or 20/80). This is a simple percent increase formula. When you don't know the profit, only how much we bought something for (cost) and sold it for (revenue), we simply substitute profit for the formula for profit. Profit = revenue - cost, so markup = 100 * (revenue - cost) / cost. And finally, if you need the selling price, then try revenue = cost + cost * markup / 100. This is probably the most common scenario - you know how much you paid for something and what is your usual markup and want to find out the sale price. Go ahead and try to enter different numbers into the markup calculator! Fill in any two fields, and the remaining ones will be automatically calculated. The reason for the simplicity of this approach is that the markup percentage is set according to what is common in the industry, habits of a company, or rules of thumb. Besides, the price depends only on the chosen markup applied to the unit costs, and it disregards any other aspects, such as a shift in demand. Therefore, any change in the expenses leads directly to a proportional shift in price. Relying merely on the typical markup rate and unit costs doesn't require extensive research or analysis which makes the approach very popular: around 75 percent of companies employ cost-plus pricing method. However, the cost-based approach has severe disadvantages resulting from neglecting consumers' behavior. To illustrate this, let's imagine that you are a producer of umbrellas with the unit cost of 5 dollars that you are selling for 10 dollars each according to the chosen markup and unit costs. The demand for umbrella can change very quickly depending on the weather: on sunny days probably only a few customers would buy your product for this price; thus you are losing potential customers and income. However, on rainy days the demand for umbrella most probably rises. Therefore, customers would pay even more money to get your product so you would sacrifice a large margin. Nevertheless, pricing by applying a typical markup on unit costs can lead to optimal prices when competitors have similar costs and apply the same markup. Still, taking into consideration the behavior of consumers in a competitive market can help you to optimize the price of a product. In other words, linking markup to the price elasticity of the demand can make your price management more efficient. Besides, it is the marginal cost, the cost added by producing one additional unit of a product, which should be multiplied by the market behavior dependent markup ratio. the markup should be adjusted to the competition. The advent of web-based business models (for instance, YouTube, Netflix) and the sharing economy (Uber, Airbnb) coupled with the opportunities given by the Internet has a crucial effect on pricing strategies. Since the marginal cost of the products or services of these businesses tends to be zero, the resulting price also tends to be low, which also can contribute to low inflation rates. If you became curious what are the typical markups, read further, and you can get some insight about the average markups in different industries. Have you ever wonder about the markups of a product or service you buy? Although there is no universal markup even between the same category of products, in different industries sellers define markup very similarly. The main reason is the similar cost structure in a particular sector; more specifically, the unit cost and the marginal cost are much alike. As a general rule, where unit costs are low, markups tend to be low as well. markups in the automotive industry are generally low (5-10 percent); however, for sports cars, they can exceed 30 percent. It is important to note that high markups do not always mean high profits. The restaurant industry, for example, uses relatively high markup ratios, but the profitability of the sector is generally low as the overhead costs are high. greeting cards, college textbooks, eyeglass frames, and bakery goods also have excessive markups. 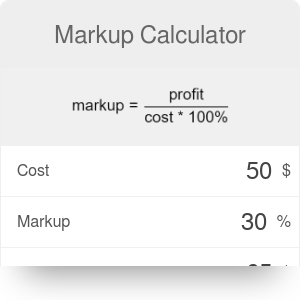 Markup calculator was one of our first financial calculators that got a lot of love from our users. It's just one of those tasks that salespeople have to perform often - they enjoy the flexibility of our tool (and the fact that they don't have to know how to find markup). Scarborough, N. M. and Cornwall, J. R.: Essentials of Entrepreneurship and Small Business Management. Global Edition. Pearson Education Limited (2016). Simon, H. and Fassnacht, M.: Price Management - Strategy, Analysis, Decision, Implementation. Springer Nature Switzerland AG (2019). Simon, H.: Confessions of the Pricing Man - How Price Affects Everything. Springer International Publishing Switzerland (2015). Markup Calculator can be embedded on your website to enrich the content you wrote and make it easier for your visitors to understand your message.